The Fallot family has enjoyed a worldwide reputation for exceptional quality mustards, since 1840. The mustards are made in Beaune, France near Dijon, where seeds are selected for their high quality and then ground in a traditional stone mill. 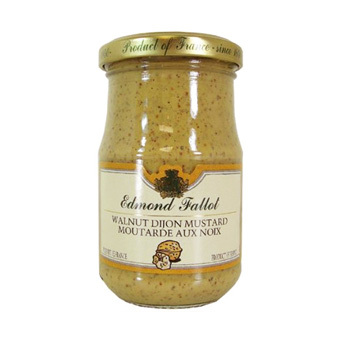 Walnut Dijon Mustard is produced by combining the classic flavor of Fallot Dijon Mustard with walnuts grown exclusively in Perigord, France. The result is a distinctly nutty, full flavored condiment that compliments poultry, meats, fish, cheeses, vinaigrettes and of course, sandwiches. 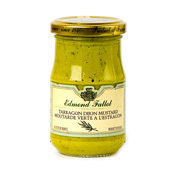 On reviewing Walnut Dijon Mustard, Florence Fabricant of The New York Times says "This new walnut mustard made in Burgundy takes no prisoners. 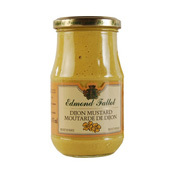 It's seriously forceful, tart and pungent, the way Dijon mustard used to be before it was tempered for global tastes. It has the added allure of ground walnuts, giving it more texture and earthier flavor than the company's plain Dijon. Use it to season a salad dressing made with walnut oil." Marc Désarménien, grandson of Edmond Fallot, heads the last independent mustard mill in the Burgundy region of France, owned by his family since 1840. 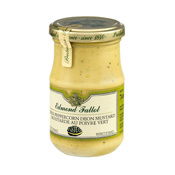 Located in the town of Beaune, "La Moutarderie Fallot" manufactures exceptional mustards. A land of vineyards, Burgundy was always well located to furnish the increasingly numerous mustard makers in and around Dijon with new wines and vinegar. It did not take very long for mustard to become a real tradition in Dijon. In 1634, the first official articles of association of the City of Dijon Corporation of Vinegar and Mustard Makers came to regulate the craft. While the Fallot Mustard Mill has outstanding production facilities, it has also maintained the expertise of the artisan mustard maker. Mark Désarménien, is proud to continue the uncompromising production of Dijon mustard by stone grinding the seeds, artfully blending them with the highest quality ingredients and following the Fallot's own family recipes. Fallot Mustard Mill is one of the few companies in the world to use traditional stone milling methods which retain all of the paste's gustatory qualities, and give Fallot mustards their incomparable taste and flavor. The result is a piquant quality and robust taste not available in commercially produced "Dijon-style" mustards.